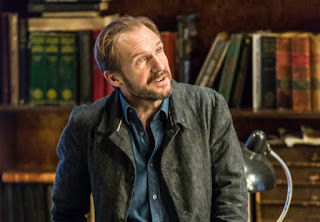 Last Friday night Stuart and I went to see Matthew Warchus's production of Henrik Ibsen's The Master Builder at the Old Vic Theatre in London's glitzy Waterloo. Starring Ralph Fiennes in the titular role the play is a deeply peculiar, symbolism-saturated oddity. Largely autobiographical the story tells of a master builder who racked with guilt for past misdemeanours takes on an air of aggression aimed pretty much all around him. He doesn't build churches anymore - not since the tragedy of losing his son - something for which he blames his wife, played marvellously by Linda Emond. He is jealous of his up and coming architectural trainee - despite having crushed that guy's father's rival business - driving him to an early grave. His admin assistant is in love with him - a love he doesn't return but which he uses and manipulates to his own ends. Even the local doctor, played by James Dreyfus, gets it in the neck. Yes, folks, it's an angst ridden show. Then enter stage left a woman, played by Sarah Snook, from the master builder's past. Someone he made a promise to a long time ago. She says the unsayable, gets all Freudian about church spires and forces our anti-hero to confront his past - with tragic consequences. Fiennes is excellent. The play however is rather hard work. And at nearly three hours is to be frank a bit of a chore. Recommended - if you like Ralph. But then who doesn't?